"Eee? Why is the image distorted?" Yupz, thats right! The 3D glasses... Hold on tight, as I bring you into my memory and show you what's the party all about! 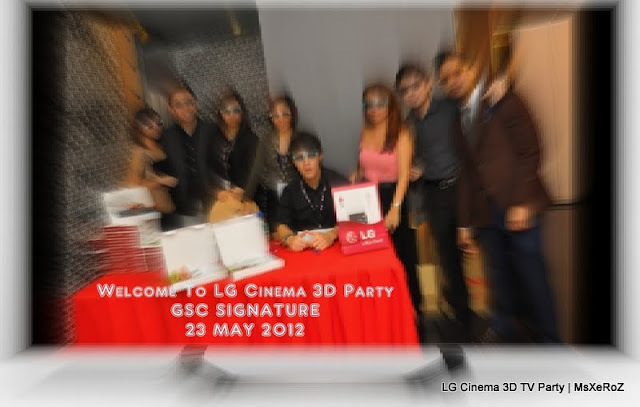 The long awaited LG 3D Cinema Party was held in the GSC Signature, Gardens on 23rd of May 2012. 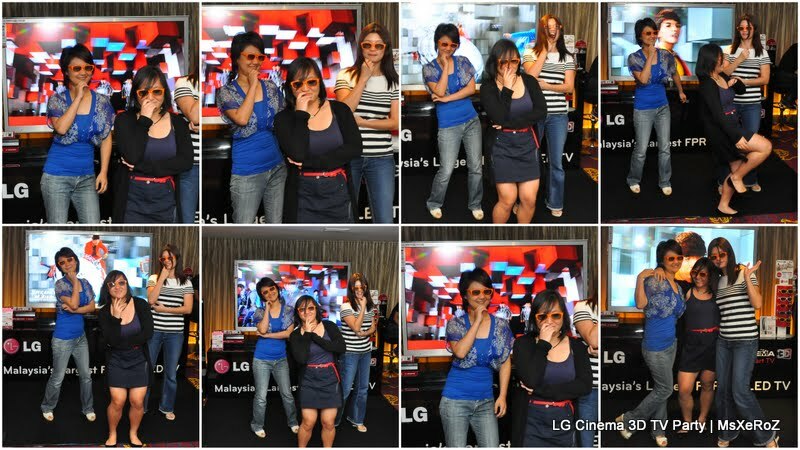 Bloggers were invited by Nuffnang KL, and the lucky guests are welcomed by these cool bunch of guys and girls! Upon entry we were given a pair of chic sun glasses, which is the LG 3D glasses. I walked inside and saw a neatly decorated gallery of LG Cinema 3D TV information, as well as a peculiar board that provides WiFi network and the password... Hmmmm... I had a hunch that whatever TV featured tonight, is not just, any ordinary TV. 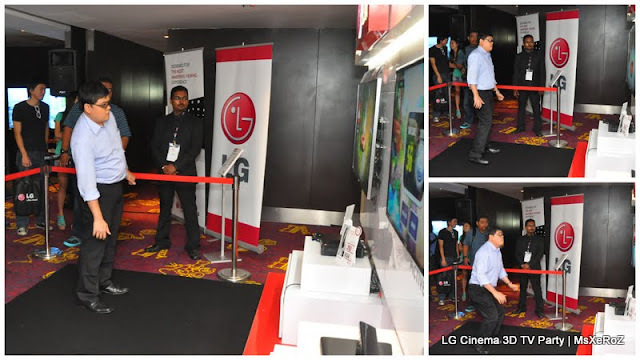 Featured products were being placed strategically, and a brief introduction is provided by LG Home Entertainment representatives who were handsomely dressed ^.^ This is where, the LG Cinema 3D is being unveiled. 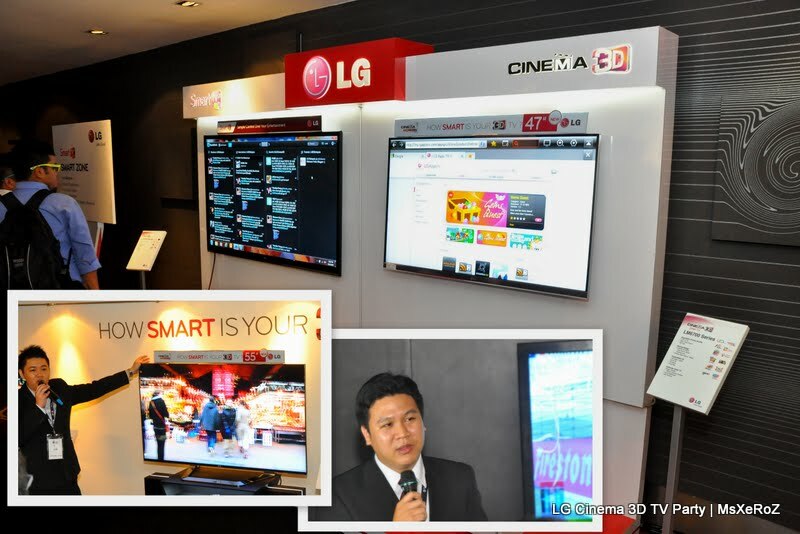 This is where Mr. Justin Seng, the manager, patiently explains the functions, features and the ability of the Smart TV. Complete, functional product ranges were being exhibited. 1) DUAL PLAY capability: Suitable for 2 gamers to play together simultaneously. a 72" CINEMA 3D Smart TV fit for a palace! 4) Game Zone which will eventually be the contest platform of the night..
As the aroma of the food being prepared fills the hall, Andrew announced, "Dinner time"!! We were led into a small cinema...the GSC Signature seats to have a comfy dinner. After the food, bloggers and guests gathered at the galleria and this amazes me! Nope, it's not a PC monitor, but a Smart TV!!! LG is very smart in attracting me with this screen. A LARGE, crystal clear screen of Tweetdeck! If it can be use to tweet, imagine what more it can do! 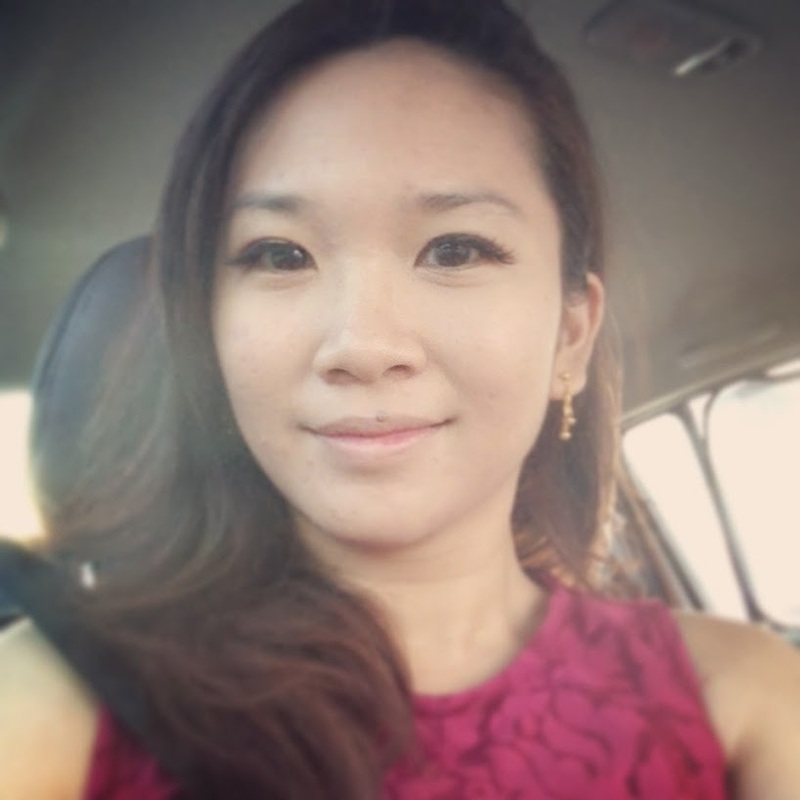 Facebook, Blogging, Stream online Korean Drama and Hollywood Blockbusters! 2 Players can play this game simultaneously, however, there's 2 TV provided, and we can see the difference between the television screen. Anyway, who is this cute little blogger boy on the right? Well, knowing that gaming isn't my cup of tea, I proceeded to the Television area and enjoyed watching what the 3D TV can offer. I find the Cinema Screen Design very attractive, as viewers can enjoy watching television without having eyesore-inducing thick frame! 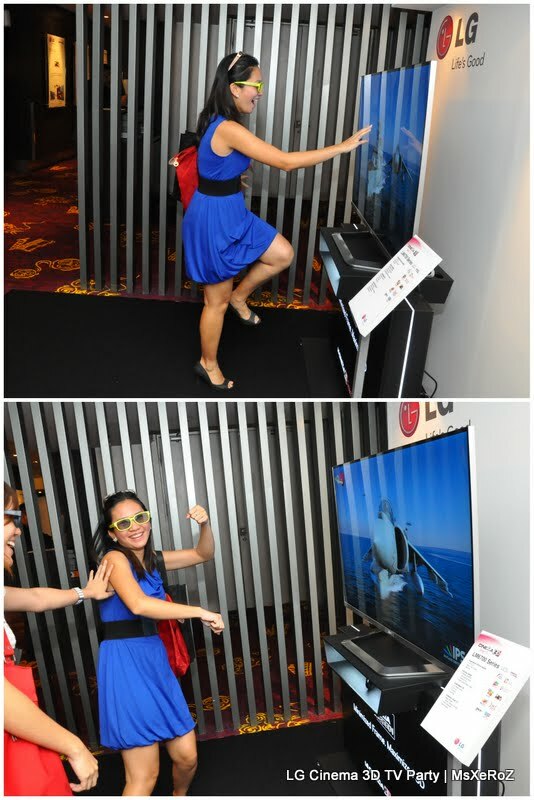 To my amazement, LG Cinema 3D TV is so smart that it has a feature called the 3D Depth Control. This means that, you can customize the depth of the 3D effect, so that whatever movie you are watching, can always give you the best 3D experience. I find this extremely useful for a more realistic movie experience. Again, i find the image clarity very good, and Flicker Free. Usually with 3D, the image would sometime flicker. 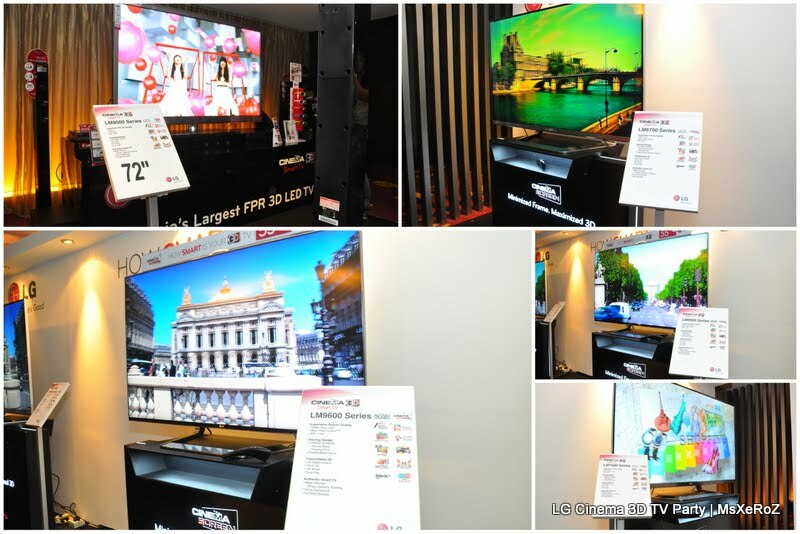 But LG overcame this problem and proudly declare that this Smart 3D TV is flicker free! Initially I was sceptical about 3D technology, because wearing glasses is a fuss. But throughout this event, I see people wearing the glasses and forgot about it! To be frank, I like the glasses too! Weighing at 16g, the Comfortable 3D Glasses was light until we never felt as though we were wearing any glasses! Most importantly, these glasses DO NOT REQUIRE CHARGING and emit NO RADIATION. Colourful, yet comfortable 3D glasses which are very different than those i've used before! I just found out that no batteries are needed for this glasses. Not only that, Kpop Lovers can watch their idols 3D (LIKE REAL) omg! This is because LG Smart TV comes with a K-POP Zone, providing instant access to the hottest Kpop content..
Best news of all! There's a feature called 2D to 3D! This means that any 2D movie/drama can be converted by this SMART TV to 3D!! The first thing I'm gonna do is upload a video of myself and watch myself walk around naked LOL in 3D!!! In twitter contest, everyone with a smartphone and data plan (WiFi provided) can participate. Questions will be asked from time to time by the emcee, and the fastest to tweet the answer to that particular questions was declared winner. Bloggers were group based on the glasses colors and all they had to do was dance their soul out. The result of the wacky combinations of dance moves were really entertaining! p/s: I renamed the group because I cant remember what are their group names. HAHA..
Anyways, it was a great show by all the bloggers who danced! Congratulations to all of the Mini Contest Winners! Winners for the Kinect Game. Winners for the Twitter Contest and Kpop Dance. 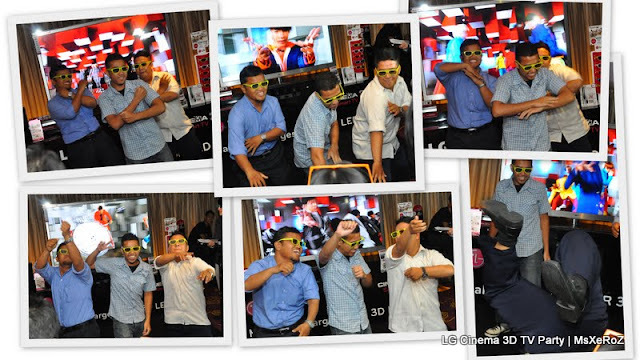 Prize: 3D Blu-ray Home Theater System worth around RM 1,500. So after the event has ended, we still lingered around. I would kill to have the TV (with my gun fingers) LOL! Love the falling petals...It really felt as though we can actually catch the petals! Seriously, the glasses are trendy and comfy! Look at how good looking we all were wearing them! Oh ya, did i mention that if i would want to bring home the LM9600 that night? Here's some of the reasons why i feel LM9600 is the one and only television that everyone should have! with 20 (TWENTY!!!) SMART features that brings you to a new height of television time! Click here to know more about the LM 9600. Seriously, the LM 9600 complete with LG Home Theater System will totally revolutionize home entertainment. That is why this event is an eye opening experience. We appreciate what technology has bring us, here's our token of appreciation to LG. 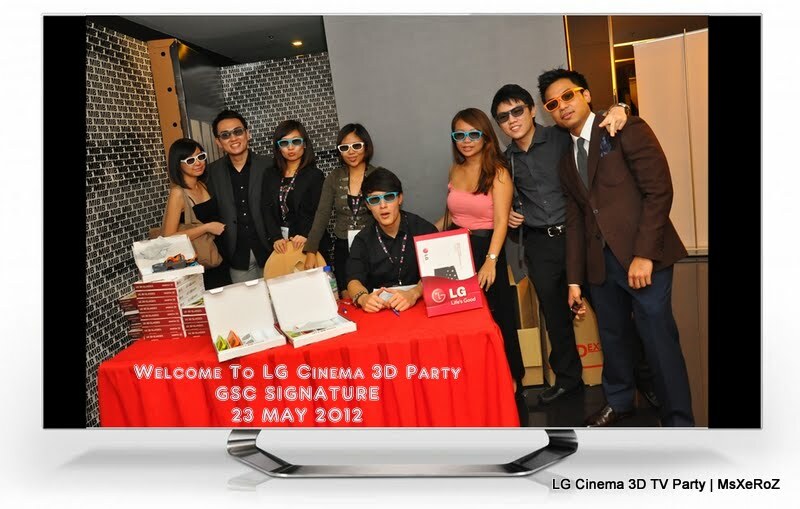 I want the LG CINEMA 3D SMART TV so badly!!! 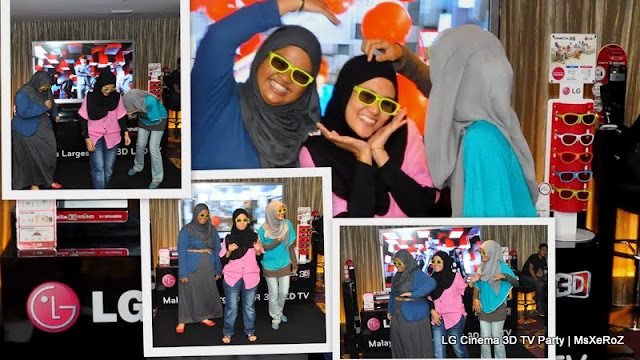 Life's Good when you are given an opportunity to win a unit of 42” LM6700 Cinema 3D Smart TV worth RCP RM4,499 by writing a post event blog post. As you all know, I have a CRT Monitor TV that was donated to me (second hand) when I move into my new home in January. I have a nice condo, but a big, fat TV.. =.="
Laying on the couch, watching drama. Even pet rabbit wanna watch together! I soooo want to try out the smart tv as well. wanna see myself how awesome is that thingy-ma-bob. Actually I really like the design of the LG Smart TV.. It's almost seamless... and Girls' Generation are the ambassadors for LG Smart TV in Korea. LOL! I was really amazed by their 3D effects too. Imagine can watch SNSD's MV and see them together in 3D. @Nana, you brat! how can u miss this event! hahaha..
@Dylan, yes! the design is really beautiful. I was so excited about the party that prior to this event, i went to check out some 3D tv. 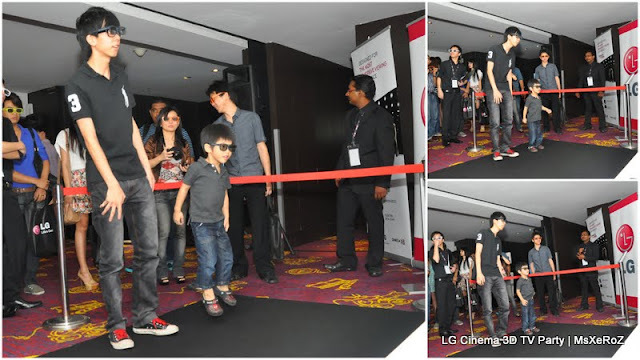 none of it is as stylish as LG's! @Tianchad, haha...i guess all guys felt the same way too! @Kid... its a great experience because even when you wanna buy a tv, there's no demo like this. @Henry Tan, thanks! Hopefully can i bring home the TV. 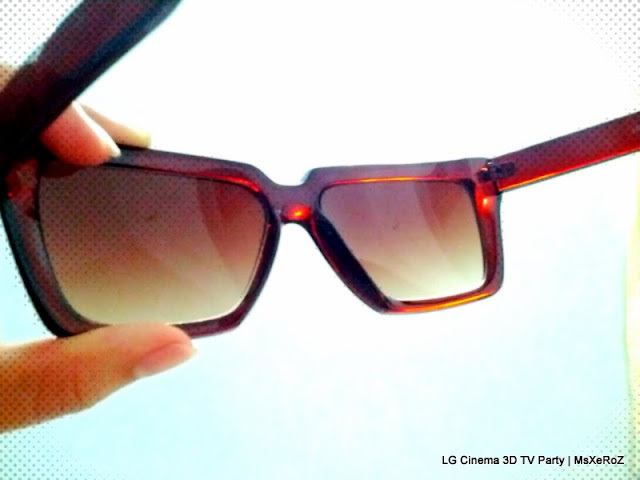 Truthfully speaking, these 3D specs by LG is not like those we had in the cinema. This one is very true fitting, and very light. Even lighter than my own glasses! They also have clip on 3D glass for spectacles user like me. That is why im impressed with LG!